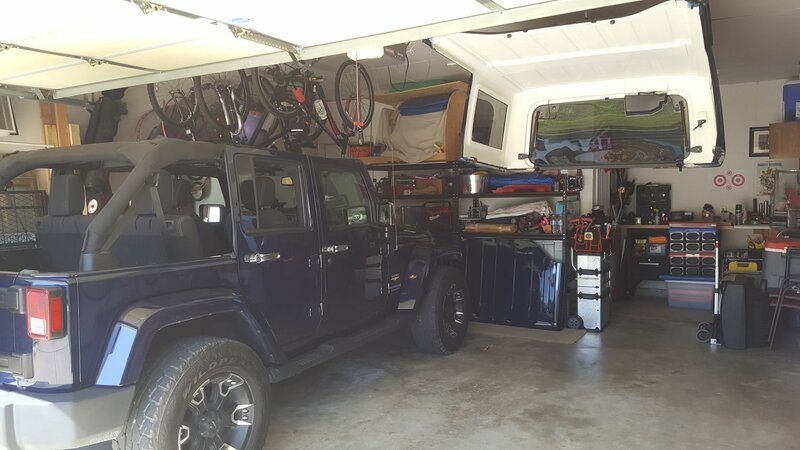 When it is time to get that heavy hardtop off your Jeep, but there is no one around to help, then let Lange Originals Hoist-A-Top give you that helping hand you need. 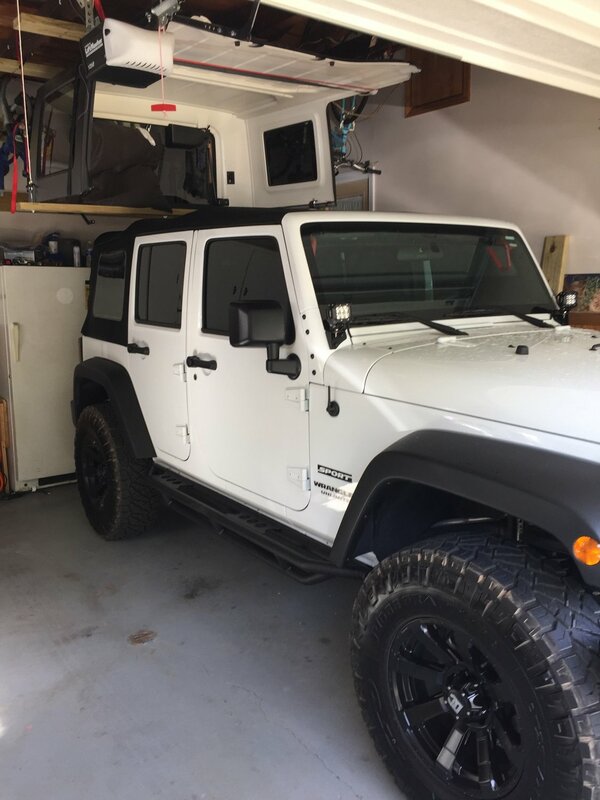 With this perfectly engineered product, you can easily lift off that hardtop and safely keep it stored for as long as you want. No need to really worry about space — it is just that easy as the top stores up and out of the way. 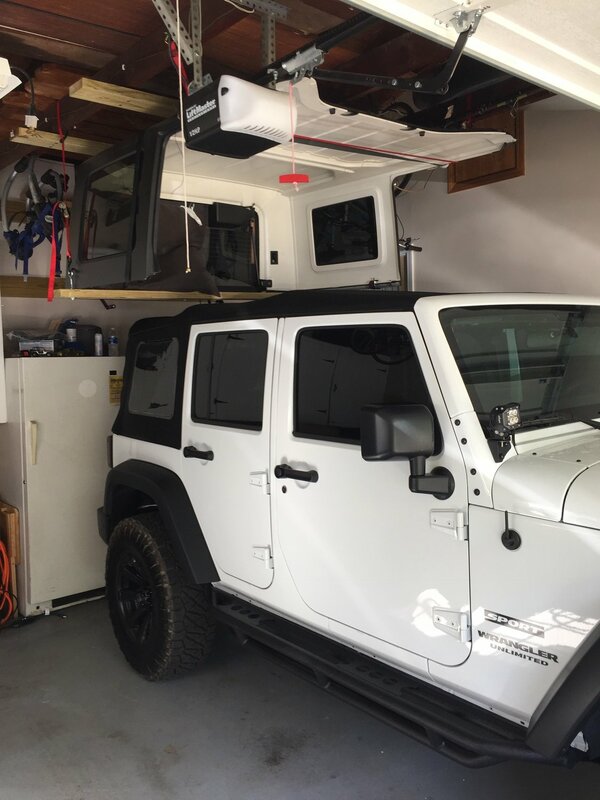 Lange's Hoist-A-Top lifts the hardtop from two anchor points on the ceiling and attaches to the top with custom straps and Patented Smart Hooks that keeps the rear lift gate window closed while removing and during its storage. 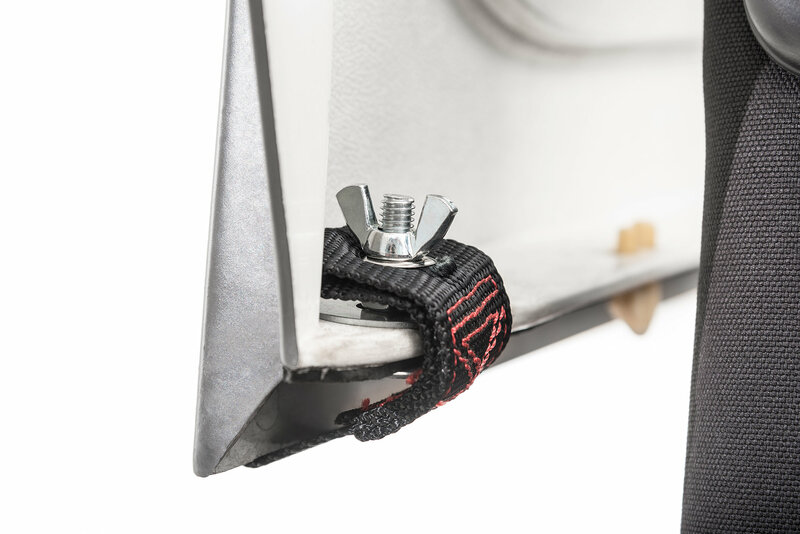 Lifting power is provided by a reliable worm drive hand crank winch and braided steel cables that will keep your hardtop securely suspended until you are ready to put it back on your Jeep. 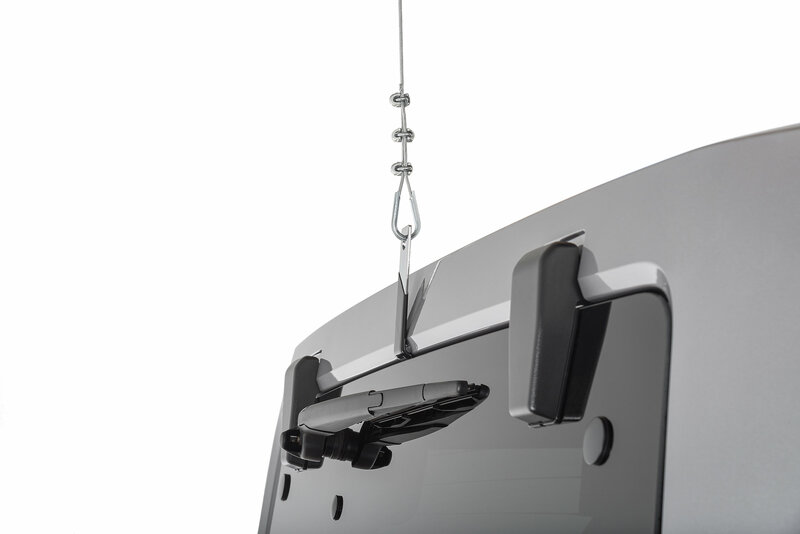 All hardware is included and the Hoist-A-Top installs with simple hand tools. 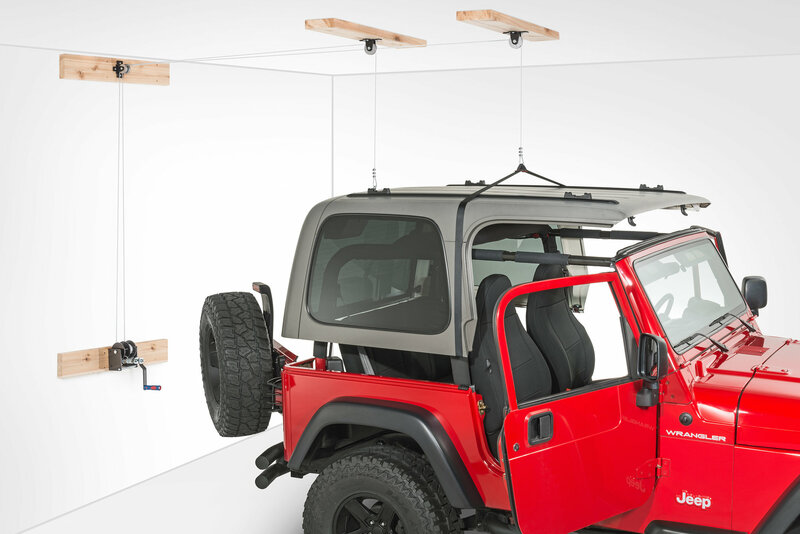 Superior Components: Lange Originals Hoist-A-Top utilizes a durable steel frame, worm drive hand crank, two 30’ steel cables, hoist, brackets, straps, hardware, and safety switch — all to keep your Jeep Hardtop safe for as long as you need. Simple Maneuverability: With its one person operational design, you can effortlessly maneuver the removal and replacement of your Jeep’s top all by yourself. 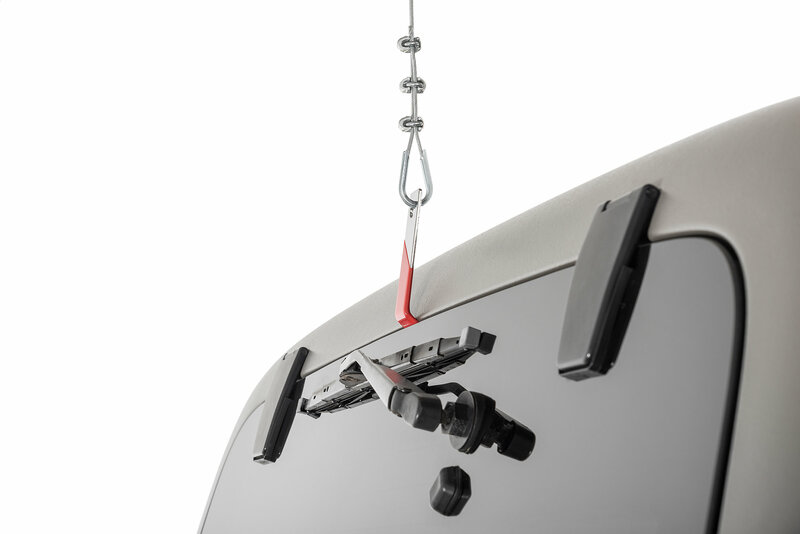 You simply attach the straps and hooks to the hardtop, and use the winch to control its movement. 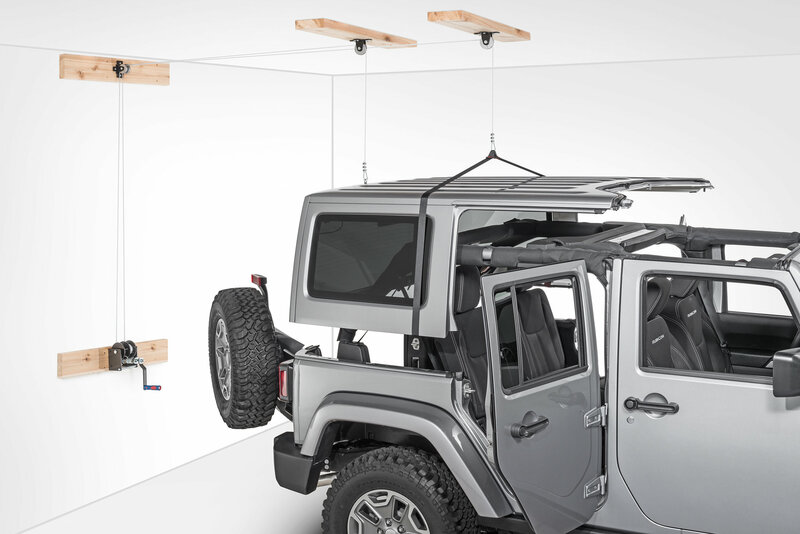 Safety Storage: Thanks to the Hoist-A-Top's strong steel cables, your Jeep’s top is easily stored up and out of the way once you’ve removed it from the vehicle. There are a lot of errors in: Lange's how-to video on YouTube and/or the Lange Originals instructions. 2. 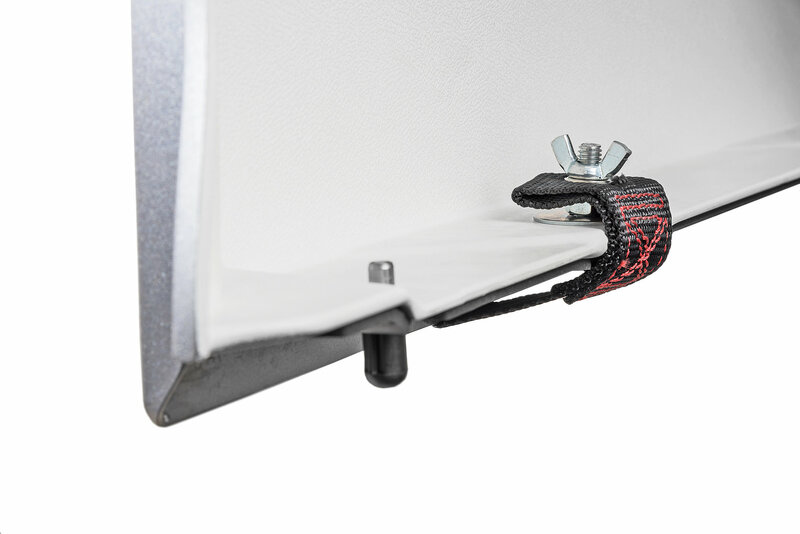 The so called 'Smart Hook', the instructions say that the RED hook is for TJ 1997-2007 only, the BLACK hook is for the YJ 1987-1995 and JK 2007-Present. The video is incorrect, the instructions are correct, in this case. 3. The instructions say to use the 2nd bolt hole in the top for the 2 door Jeeps and the 1st bolt hole for the 4 doors. You HAVE TO use the 1st hole for the 2 doors too!! Otherwise the center of gravity will be way off, and the top will lift on an extreme and unsafe angle. 4. I found that the 34" measurement, between the pulleys worked well, for me. Others have had to spread the pulleys mounting apart to 37+ inches, for their application. 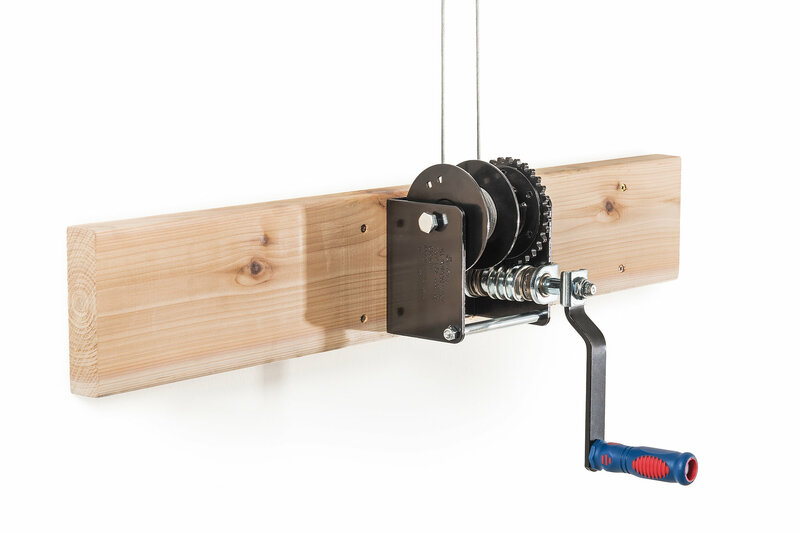 Also: ditch the 'wood screws' that are used to mount the pulleys into the wall and ceiling. They are essentially just drywall screws and not strong enough, in my opinion. Get yourself some 2" long, small diameter lags for much better strength and security. You should also ditch the small nuts, used for the cable clamps. Get yourself some nylok nuts or at least use some form of loctite on these tiny little bolts. My package came with 6 cable clamps, not 4, I used them all, 3 per cable. Finally, I wish that Lange would include an extra few more feet of cable. This would make a wider variety of installations possible, and allow for more of the cable to wrap around the pulley. For my application (14' ceiling and 4.5" lifted Jeep) the cable JUST BARELY reached, and I began lifting right on the cable's loops, with no extra wrap/windings. Lange could make this product much better with these upgrades. It would cost approximately $10 more per unit, and those are hardware store, retail prices.﻿ 3 stars for the hard to find pulleys and crank assembly, and entire package, which ended up working just fine, for me. 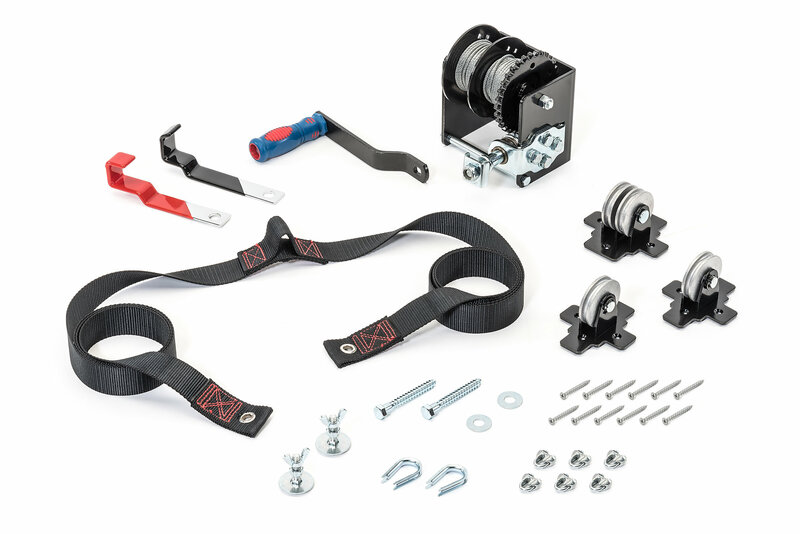 This kit provides the hard to find components for putting in a hoist. 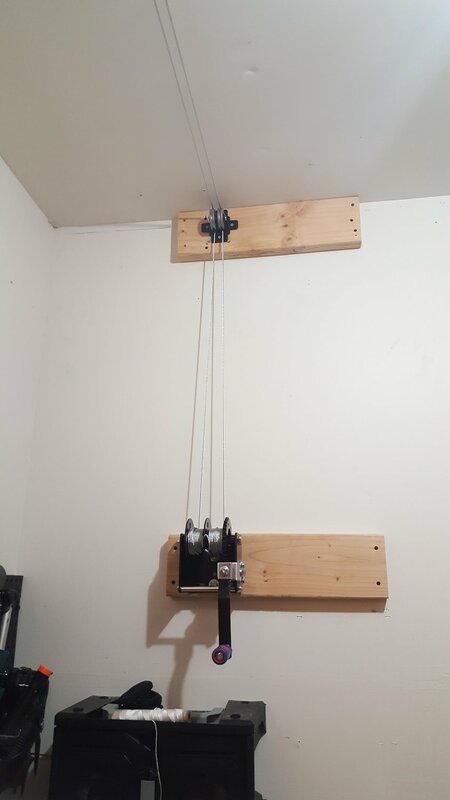 I provided the 2x6 boards, screws, and custom plan for installation because I have a door where their instructions would have me mount the winch. I took my time with the install and I'm very happy with the results. The name is an oxymoron because installation was anything but simple. I do all the work on my cars & can pretty much put together anything but this took significantly longer than it should have. The written instructions that came with the hoist were horrible and incomplete. The online video wasn’t much better with the host giving the wrong size tools for install (9mm socket for the cable locks when they need an 8mm socket for example). The measurements for the length of 2x6’s needed was also off causing multiple trips to the home supply store for more wood. As indicated in the video you will need to use a drill with socket to raise/lower the top because the hand crank is completely useless (you’ll be winding for days to get it to move an inch). Additionally, the spools that came with my kit were different than the spools shown in the written instructions and online video so we had to figure out how to wind the cable through the spools correctly because ours didn’t have the same number or location of holes as the ones illustrated. Lastly, because the pulleys are offset, your top will lift off pulling to one side, it will take many adjustments to get level/straight. I recommend purchasing nylon locking nuts to use on the cable locks because the nuts provided will have tendency to back off on their own. That or use locktite when you finally get them adjusted to where they need to be. As others have stated, there is a warning on the package that says the lifting strap will stain your painted top, so be sure to put towels between it and your top. I also ran a couple ratchet straps under the top to ensure it doesn’t come loose as I don’t have full confidence in the cables holding it up with no locking mechanism on the hand crank or spools. 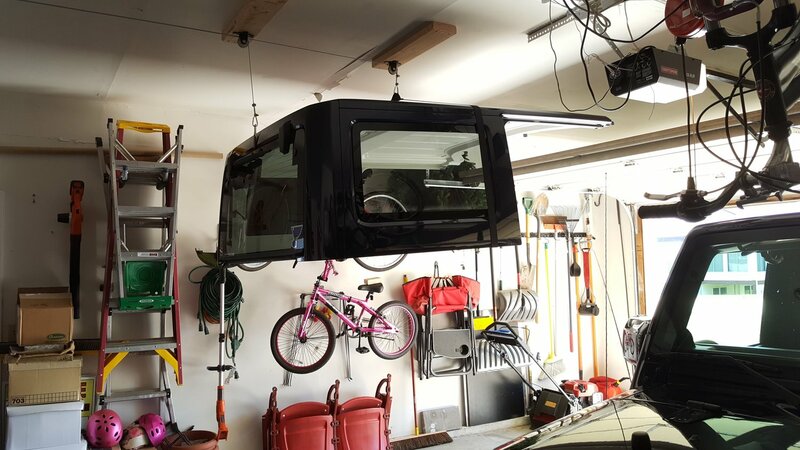 What is the maximum ceiling height for this hoist system? Per the manufacturer, the maximum ceiling height is 20 feet. Does the manual winch on this system have an automatic brake to keep it from free wheeling? Also, does it have a locking mechanism to keep it locked in any position (up or down) for storage and/or hardtop installation. Yes, it is a ratcheting winch. It will stay locked wherever you stop cranking. How long are the cables that come with this unit? Hello, this unit comes with a 40' steel cable. Thank you for your question.